JAY-Z has been sharing "Footnotes" for each video released from his new album 4:44, and the latest documentary segment for "Adnis" from Neil Brennan is a very personal one. 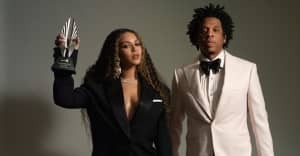 It begins with the rapper describing his relationship with father Adnes Reeves, who left the family when Shawn Carter was 11. The two men were estranged until 2003, when the two reconciled shortly before Reeves died of liver failure. Other perspectives on being a father and having one are provided by Anthony Anderson, Mahershala Ali (who stars in the main "Adnis" music video), and Will Smith, who comes with an illuminating story about Willow Smith. He recalls the early days of tour with his daughter after the release of "Whip My Hair." After five days of concerts with thirty left, Willow wanted to go home, but Will told her no. The next day, "She had shaved her head bald," Smith says in the clip. "She shaved her head bald in the middle of the 'Whip My Hair' tour. And I'm looking at that girl like, 'got it.' I understand. You will not have this trouble out of me ever again. Let's go baby, we can go." The experience allowed Smith to let go of some of the ways he was raised by his own father. "For me," he said. "It was that soldier that was pushing and wasn't paying any attention whatsoever to what was going on emotionally with this beautiful little creature in front of me. And that was the first part of the collapsing of my father's suit that I was wearing that wasn't mine."